Occupational health and safety related to the work which is done in workplaces in general people full body health and safety provision. In our country, the occupational health and safety risk assessment analysis moral, legal, and indirect costs has become crucial. Located in the workplace or identification of hazards from outside intrusion. It turned into a risk of danger that led to the factors analyzed by ranking of the risks arising from the dangers with and control measures will be utilized for the purposes of risk assessment and analysis work required. These occupational accidents are a problem that must be resolved as a country reality. Any work that does not have security and supervision issues an accident invitation. Today, worker health and work safety remain a problem that needs to be resolved. In this study, the penalty and legal aspects of occupational health and safety have been examined by focusing on work accidents that have been passed on to many nominations. Cotter, D.M. (1986). Work-related deaths in 1984: BLS survey findings, Monthly Labor Review, 109, 42–45. Gens, D., Jones, J.W. & Nesbit, G. (1984). The Employee Injury Profile, St. Paul, MN: The St. Paul Companies. Hansen, C. (1989). A casual model of the relationship among accidents, biodata, personality, and cognitive factors, Journal of Applied Psychology, 74 (1), 81–90. Jones, J.W. (1989). A personnel selection approach to industrial safety, Paper presented at the 97th Annual Convention of the American Psychological Association, New Orleans, August 13. Jones, J.W. (1991). Accident prevention through personnel selection, In J. Jones, Editor, Preemployment Honesty Testing: Current Research and Future Directions. Westport, CT: Quorum Books. Jones, J.W. & Foreman, R. (1984). Relationship of PSI-3S safety scale scores to motor vehicle reports, St. Paul, MN: Technical Report: The St. Paul Fire and Marine, The Human Factors Department. Jones, J.W., & Wuebker, L.J. (1985). Development and validation of the Safety Locus of Control Scale, Perceptual and Motor Skills, 61, 151–161. Jones, J.W., & Wuebker, L.J. (1988). The psychological assessment of employees' safety potential, Park Ridge, IL: Technical Report, London House, Inc., Research and Development Group. Montag, I., & Comrey, A. (1987). Internality and externality as correlates of involvement in fatal driving accidents, Journal of Applied Psychology, 72 (3), 339-343. Wuebker, L.J. (1987). The Safety Locus of Control Scale: a construct validation study, Unpublished manuscript. Wuebker, L.J., Jones, J.W. (1985). Safety locus of control and employees' accidents, Paper presented at the Sixth Annual Industrial/Organizational Psychology Graduate Student Conference, University of Akron, Akron, Ohio, April 12-14. Zohar, D. (1980).Safety climate in industrial organizations: theoretical and implied implications. Journal of Applied Psychology, 65, 96–102. Zile M. (2017). Determination of Electricity Work Accidents and Defect Rates in Our Country, International Conference on Multidisciplinary, Science Engineering and Technology (IMESET'17 Bitlis), Oct 27-29, Bitlis. Zile, M. (2015). Modeling Job Security Risk Assessment Analysis and Fuzzy Logic Generation of Software, Çukurova University Journal of the Faculty of Engineering and Architecture, 30 (2), pp. 267-273, ISSN 1019-1011, Çukurova University. Zile M. (2013). Formation of Occupational Safeguards and Occupational Safety in Forensic Cases Based on Electric Energy, VIII National Occupational Health and Safety Congress, Publication No: E/2013/600, ISBN: 978-605-01-0469-1, 293-300, University of Cukurova, Adana. ISNAD ZİLE, MEHMET . "Analysis of The Legal Aspects of Work Accidents". 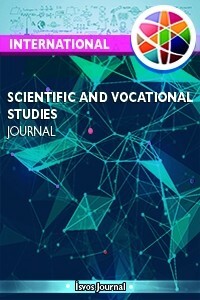 International Scientific and Vocational Studies Journal 2 / 1 (June 2018): 1-7.